It was not until several weeks after he had decided to murder his wife that Dr. Bickleigh took any active steps in the matter. Murder is a serious business. The slightest slip may be disastrous. Dr. Bickleigh had no intention of risking disaster. 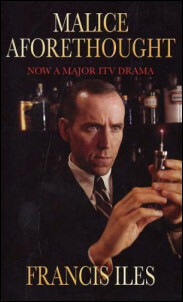 A few years ago, Teresa and I read Before the Fact by Francis Iles (the basis for the Hitchcock film Suspicion.) We both enjoyed it, finding it creepy and disturbing — just the way we like it! — and I put Malice Aforethought onto my list immediately. Just as I had hoped, this is another atmospheric thriller, which manages to be suspenseful and darkly funny, despite the fact that you know the killer from the first sentence of the book! Edmund Bickleigh is a henpecked little village doctor with a powerfully disapproving wife. When we see the distant and sarcastic way Julia treats him, we are instantly sympathetic to his tendency to seek comfort elsewhere, particularly since that comfort only takes the form of daydreams: Bickleigh Wins Wimbledon, Bickleigh Exhibits at the Royal Gallery, that sort of thing. It is only slowly that we begin to realize that Dr. Bickleigh has looked for other kinds of comfort as well: he has a history in the arms of the wives of his friends. Now he has fallen in love (he is sure this time it’s for real!) with Madeleine Cranmere, the new occupant of the Hall, and Julia must go. Iles builds up the suspense of Bickleigh’s carefully “perfect” murder at the same time as he is tearing down his character. When the story begins, Bickleigh is charming and long-suffering; Julia takes pleasure in ridiculing him in front of his friends, and we understand even his momentary murderous impulse. By the end of the book… let’s just say that circumstances have significantly changed, and we can no longer count on our first impressions of anyone at all. Iles is quite funny, along with being gripping and disturbing. At one point, Julia (who is grimly hanging on to her taste and decency throughout the novel) goes to see Madeleine Cranmere. When she returns, she confronts her husband. “She received me in a white cotton nightgown,” she continued surprisingly, and a red flannel dressing gown.” She paused significantly. “Oh, yes?” said Dr. Bickleigh vaguely, not seeing the significance. Cotton was perhaps not the material he himself would have chosen for a nightgown, but it was only another example of the charming unsophistication of Madeleine’s tastes…. Francis Iles is a pseudonym for Anthony Berkeley Cox, who wrote quite a lot of other mysteries. The pleasure I took from Malice Aforethought and Before the Fact make me think I should go find them! Sounds like something I’d love to read, thanks for the heads up. Try Before the Fact, too! I have heard so many good things about this one. Another title for my “WannaRead” list! Thank you for describing it so well, and mentioning that it’s atmospheric–an element that I love in mysteries. I’d never heard of Iles before I read the other one with Teresa, so I’m glad you’ve been hearing the buzz. Definitely two good mysteries. I’m intrigued by the changes in perception that you mention – I do love a twisty story. How does the first book compare to the film? I don’t remember that having much humor. The first book was quite different in tone from the film, mostly (I think) because the film lets you wonder who the murderer really is, whereas the book does not. The book is really more ambiguous about the POV character. Also, the man in the book is much sleazier than they would let Cary Grant be! I’ve had this on the shelf for ages and remember other posts by you two on Iles. MUST read it! Sadly Before the Fact wasn’t available at a reasonable price last time I looked. I think Arcturus Press reprinted it? Have a look! But they are both great. I read this a few years ago and really enjoyed it! I remember the early parts being extremely amusing and droll, and then the later ones properly tense and intriguing. It’s clever of Iles to pull off the murderer being announced on the first page. I’d like to see an author do that today without descending into sensationalism!